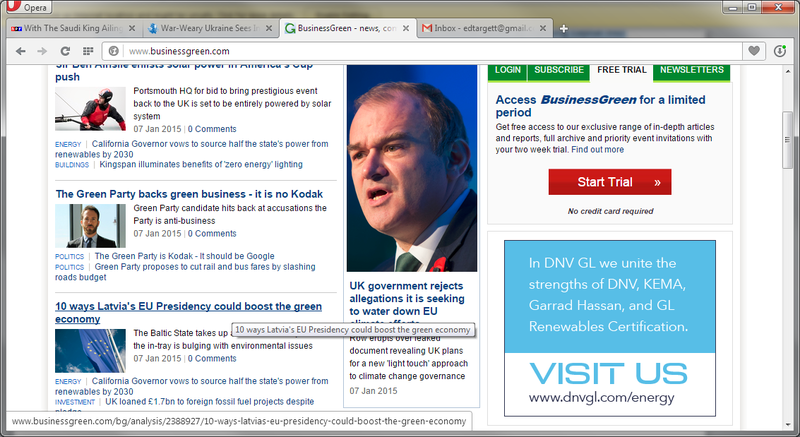 I’m delighted that the excellent Business Green website gave a prominent space to my reply to an op-ed piece that had questioned the business friendliness of the Green Party. My reply was the 5th most read piece on the website this morning. This is important why? It reaches tens of thousands of businesses in what is crudely characterised as the sustainability sector daily and I am keen to get them to come and invest in Thanet North. Below, an excerpt from my piece. Brendan suggests the Green Party is inherently anti-business. I don’t believe this to be the case at all. As the Green Party parliamentary candidate for Thanet North — an desperately in need of investment and jobs — I’d be hugely keen to see Business Green’s readers bringing their businesses to the area. With regard to fiscal responsibility, numerous Greens remain concerned about sovereign debt (up massively since the financial crisis, as zombie private balance sheets became vampiric public ones) and the broader need for an economic and environmental transformation. I doubt that it makes any Green Party member happy that the UK spends £1 billion on debt interest per week (more than it spends on education) or that at £1.63 trillion, the state’s net liability at last count was an increase of £283 billion year-on-year; the largest-ever recorded rise*. Westminster, we have a problem and austerity is clearly not the answer. The report found an increase of 1 percentage point of GDP in investment spending in advanced economies raises the level of output by about 0.4% in the same year and by 1.5% four years after the increase, with the boost to GDP from increasing public infrastructure investment offsetting the rise in debt, so that the public debt-to-GDP ratio does not rise. Why is this important? Significant public infrastructure investment is something the Green Party has been arguing for many years, notably since Caroline Lucas MP teamed up with Guardian economics editor Larry Elliott and renowned tax expert Richard Murphy in 2008 to call for a sustained and large-scale programme of investment in renewable energy as part of a wider environmental and economic transformation in the UK. Their “Green New Deal” urged the creation of a new alliance between environmentalists, industry, agriculture, and unions to put the interests of the real economy and the environment ahead of those of the asset-stripping, hot money crowd. Few will doubt this is needed: The proportion of the UK’s national income devoted to investment ranks 142nd in the world, alongside El Salvador. Here in Thanet North meanwhile, the Conservative MP has told the well-regarded owners of Sandwich’s resurgent Discovery Park R&D and biosciences hub that he will not support their plans to create a business park and manufacturing base on the now defunct Manston Airport. As the Green Party candidate, I know I’d love to see Business Green’s readers coming and investing here in East Kent and would be delighted to show you around.